Habit: Annual to perennial herb, +- erect, from caudex, taproot, or rhizome; rarely dioecious. Leaf: petioled or not; linear to oblanceolate, vein 1. Inflorescence: generally terminal, open to dense; flowers few to many, pedicels generally 5--40+ mm. Flower: generally erect, generally bisexual; sepals 5, fused, tube prominent, 4--38 mm, 2--13 mm diam, cylindric to bell-shaped, rounded, hairs various or 0 (walls between hair cells generally clear), veins generally 10+, generally dark, lobes or teeth 1--13 mm, < tube, triangular to linear; petals 5, 6--62 mm, claw long, limb entire or 2--6-lobed, appendages at junction of claw, limb 0--6, generally 2, basal lobes present or 0; stamens generally fertile, bases fused with petal bases to ovary stalk; ovary chamber 1 or +- incompletely 3--5, styles 3(4,5; if 5 then flowers unisexual, taxon dioecious), 1--35 mm. Fruit: capsule, cylindric to ovoid; stalk (from ovary stalk) 0--7 mm, generally glabrous; teeth 6 or 10, ascending to recurved. Seed: many, gray to red, brown, or black. Species In Genus: 700 species: North America, South America, Eurasia, Africa, introduced +- worldwide. Etymology: (Greek: probably from mythological Silenus, intoxicated foster-father of Bacchus, who was covered with foam; from sticky secretions of many species) Note: Oxelman et al. 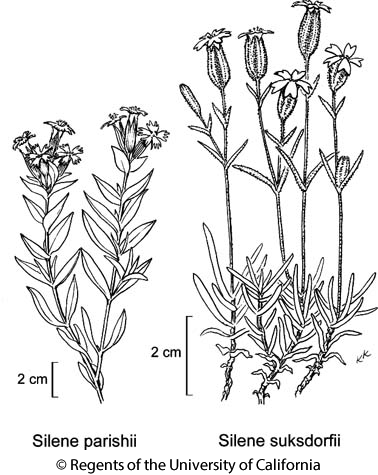 (2001 Nordic J Bot 20: 743--748) including data for disarticulation of Silene into four additional genera, including for California Lychnis (Lychnis coronaria) and Atocion (Atocion armeria (L.) Raf., as Silene armeria here). Habit: Perennial herb 10--40 cm; caudex branches generally many. Stem: ascending to erect, strigose to short-hairy, glandular below or throughout. Leaf: slightly reduced upward, 1.5--6 cm, 5--15 mm wide, lanceolate to +- ovate. Inflorescence: pedicel +- 0 to short. Flower: calyx 24--29 mm, short-glandular-hairy, 10-veined, lobes 4--8 mm; petal claw ciliate to puberulent, appendages 2, limb 7--10 mm, yellow-white, lobes +- 6; stamens +- = petals; styles 3, +- exserted. Fruit: ovoid to elliptic; stalk 2--3 mm. Seed: 1.5--2 mm, brown. Chromosomes: 2n=48. Citation for this treatment: Ronald L. Hartman, Richard K. Rabeler & Dieter H. Wilken 2012, Silene parishii, in Jepson Flora Project (eds.) Jepson eFlora, http://ucjeps.berkeley.edu/eflora/eflora_display.php?tid=44551, accessed on April 22, 2019. SnGb, SnBr, e PR (SnJt, Santa Rosa Mtns, Hot Springs Mtn). Markers link to CCH specimen records. Yellow markers indicate records that may provide evidence for eFlora range revision or may have georeferencing or identification issues. Purple markers indicate specimens collected from a garden, greenhouse, or other non-wild location.